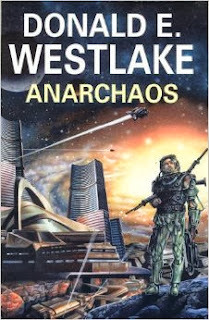 In 1967 famous mystery writer Donald Westlake wrote a science fiction novel, Anarchaos. In 2010 I checked Anarchaos out of the New York Public Library and read it. Thinking back through the haze of my vague memories, I recall finding Anarchaos’s politics irritating and plot and style pedestrian. And yet, my April 26, 2010 review on Amazon, pasted below, is downright positive! Maybe, like a college professor grading a paper excoriating his favorite author, I was overcompensating for my political disagreements with Mr. Westlake. Or maybe the years have eroded my memories of Anarchaos’s good points. Famous crime writer Donald Westlake constructs a solid adventure story in Anarchaos, a noirish tale set on a planet with no government. He incorporates a lot of elements you have probably seen before, like evil corporations, mines worked by slaves, a femme fatale, and a first person narrator on a mission of revenge, but Westlake has a good writing style and supplements the thrills and chills you expect with a main character who evolves psychologically over the course of the story, which adds an enjoyable dimension to the novel. The "point" of the novel seems be a banal criticism of laissez faire economics and the cult of rugged individualism (maybe it wasn't quite so banal in 1967) but the novel is never preachy and the fact that the narrator who is telling you how important government is is himself a criminal and terrorist adds some nuance and ambiguity. Definitely recommended to people who like SF adventure stories like Burroughs's or Vance's or Harrison's novels about a guy landing on a planet and then trying to survive/escape/achieve his mission. People who are into crime novels should also give it a shot, as it really is one of those hard boiled "somebody killed my buddy and I gotta find out who" capers, just not set on Earth.